Correlation is both a commonly used term in everyday life — where usage can be sloppy — and a scientific term where usage should be precise. Correlation refers to the degree to which two things are related to one another. Correlation is defined by a statistical measure named the correlation coefficient, which ranges between -1 and +1. A perfect positive correlation is +1 and a perfect negative correlation is -1, whereas a correlation coefficient of zero means there is no correlation at all. A perfect positive correlation means one currency will move in the same direction as the other 100% of the time. A perfect negative correlation means one currency will move in the opposite direction to the other 100% of the time. A zero correlation in science means the two variables are completely unrelated to one another, but since that is not possible in Forex — there is always some connection, however remote — we say we simply cannot predict how a movement in one will affect the other — it is a coin toss, or a random outcome. Perfect 100% correlations, either positive or negative, are possible in Forex only for very short periods of times. This is because each currency is attached to conditions in the issuing country and conditions between countries are never exactly the same. This brings up an important point — you can see currency correlation tables galore on the internet showing the correlation coefficients of Currency A against Currency B, but be sure to look at the periodicity. Some websites do not even tell you over what period they are calculating the correlation coefficient! Failure to specify periodicity is the main reason you will see different correlation coefficients on one site from another. One site will say USD/CAD is 70% correlated with AUD/USD, but another will say 96%, and another will show 45%. Each one of those numbers might be true — but for a different periodicity. Another reason for discrepancies is the amount of data that is covered. You will get a different coefficient if you look at one year of data from looking at 10 years of data. And remember, trading Forex is not a science experiment. You may want 10 years of data for a science project, where the behavior of objects can be assumed to be consistent. But in Forex, we are measuring human behavior, and while some patterns are consistent over time, more recent behaviors are more pertinent to the immediate future. This sets up a conflict of interest — you want lots of data, but you also want recent data because it is likely to be more relevant to your trading decision. In Forex, we are always talking about two currencies. A correlated pair will move in the same direction and by nearly the same extent against a third currency. This is the case with the euro and Swiss franc. Because of the strong trade ties between European countries and Switzerland, the Swiss franc tends to move in lockstep with the euro against the dollar. The correlation between the euro and Swiss franc against the dollar ranges from -0.85 to -1.00. Why the minus sign? The answer lies in the quotation convention. The EUR/USD comes first in the euro quote and the dollar comes first in the USD/CHF. Ignore the minus sign when the quotation convention is different — the high number is telling you the euro and Swiss franc move together very tightly. If you are buying the euro, you would not want to be selling the Swiss. And in the same line of thought, if you are buying both the euro and Swiss franc, you are essentially doubling your bet against the dollar — you get no diversification at all from trading the euro and Swiss franc together. It is the very essence of diversification that you have one currency with a high positive correlation and another with a high negative correlation. 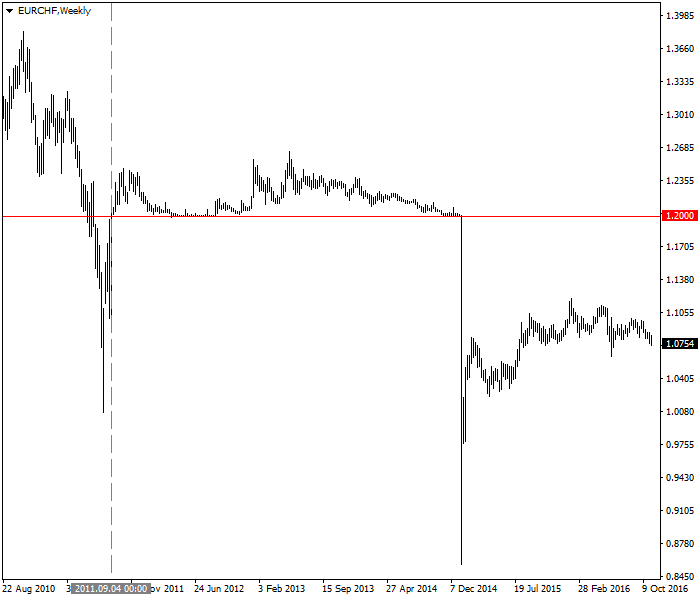 SNB installs floor at 1.2000 (red line) on September 6, 2011 (vertical gray line). Later, abandons it (notable spike down) on January 15, 2015. 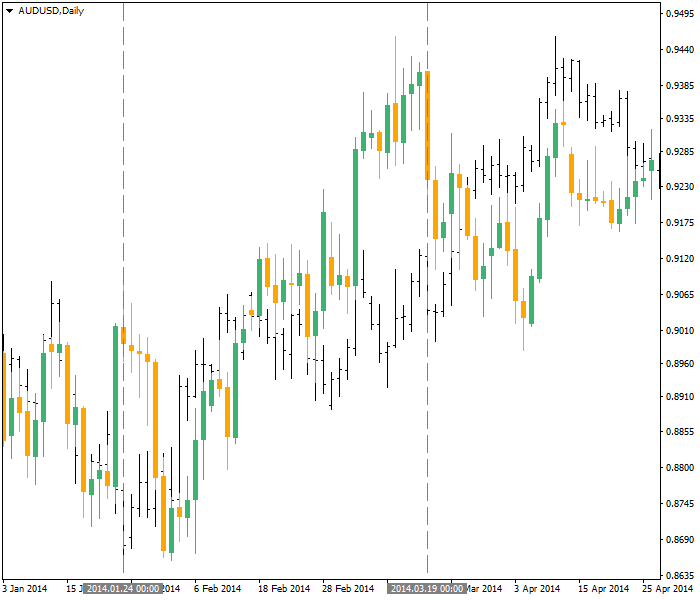 Nevertheless, the euro/Swiss franc correlation is one of the strongest in Forex. Another pair that is correlated with one another and therefore also against third currencies is the AUD and the NZD. AUD/USD has a one-week correlation coefficient against NZD/USD of 0.95. This means that 95% of the movement in NZD/USD can be explained by the movement of AUD/USD. The relationship changes a bit in AUD/EUR, which is 0.98 correlated, and NZD/EUR, which is only 0.93 correlated in the one week timeframe. As a practical matter, if you were buying the AUD against the EUR and wanted to double your bet by selling EUR/NZD, your confidence in both trades turning out exactly the same is a little lower. The important point, however, is that if you see AUD/USD or EUR/AUD start making a breakout move, the odds are in your favor that the NZD will make the same breakout move. A little market lore: before the SNB more or less fixed the permissible range for the EUR/CHF rate, for decades traders said the Swissie “led” the Deutschmark and later, the euro. In recent years, traders started to observe that the AUD “led” the euro. The chart below shows AUD/USD and EUR/USD during early 2014. At the start of the move, the AUD bottoms first (the first vertical gray line), about a week before the EUR. On the right-hand side of the chart, the AUD has been rising continuously but the EUR undergoes a correction after having risen vigorously “too far” more than the AUD (the second vertical gray line). AUD/USD (black) is plotted against EUR/USD (green and orange). No one can say whether the downside correction in the EUR to put it in more in line with the upward pace of the AUD was caused by traders noticing that the euro was rising too far, too fast compared with the AUD. Presumably, there are some traders who trade in this manner, but we do not have any hard evidence or testimony about it. Correlation websites leave a lot to be desired. Periodicity is critical. For example, on one site EUR/USD has a one-week correlation coefficient with GBP/USD of 0.94, meaning that if the euro is rising, the probability is very good that the GBP is going up, too. But on the 6-month basis, the correlation coefficient is only 0.31, a very weak reading. The implication is that if you expect a holding period of six months, you cannot count on the correlation. Similarly, EUR/USD has a negative correlation with USD/JPY of 0.23 for the 1-week period, but a far better one for the one-year period (-0.69). This means you cannot count on the yen to move in sync with the euro on a short-term basis but over the longer-run, the correlation does exist, even if 0.69 is not very strong. Be careful what you read. Newcomers to Forex can become captivated by what look like strong correlations and rush to devise trading regimes based on them. The problem with this approach is that if you have a 60-minute trading window — i.e., you plan to open and close your trade within one hour, you would want to have the one-hour correlation coefficient for the past several hundred one-hour tranches. Looking at the one-hour coefficient that was calculated last week or last month is of little or no use to you today. A random event, like a big trader changing his position or a geopolitical shock, can twist prices in one currency in a big way that does not affect the other. Similarly, if you see a table of 5-minute correlations, you will be appalled to see the variation. On one website, the correlation coefficient for AUD/USD against NZD/USD, for example, ranges from 96.4% to 12.2% over a series of 5-minute intervals. The website in this instance does not tell you how many 5-minute intervals it used or the exact dates and times the 5-minute intervals were collected. This is of no use at all. In order for a statistical measure to be reliable, it has to be based on at least 30 data points, and that is the scientist’s minimum count. In Forex, where we are measuring human behavior and not physical objects, our standard of observation has to be far higher, probably 300. Objects behave in far more predictable ways than humans! Presumably, the 5-minute trading idea in this instance would be to assume that divergence in the NZD away from correlation with the AUD would be corrected, and thus if the NZD were lagging a rise in the AUD, you would want to be a buyer on the assumption it would catch up. Given the strong correlation of the NZD with the AUD over most timeframes, this is not a bad idea, but very hard to implement in real time — and impossible if you do not have the actual correlation coefficient right now, live, in real time. Finally, it can never be repeated enough times: correlation is not causation. Even in science, we have many instances of events with super-high correlation coefficients that are not related in any way. This the true meaning of coincidence. In Forex, we sometimes have real reasons for assuming correlations, but we do not always have evidence of causation, let alone proof. Nothing illustrates this better than USD/CAD and EUR/USD. The USA and Canada are geographical neighbors and Canada is heavily dependent on the USA in trade and capital flows. But Canada is also a producer and exporter of oil, as well as other metals and commodities, with a life of its own independent of the USA. We can find good correlations of the CAD with both the interest rate differential between the USA and Canada and commodity prices, both strong fundamentals. You might think these would be determinative. Yet the correlation coefficient of EUR/CAD and EUR/USD on one site is 63.3% — no periodicity named. Another site has the correlation coefficient ranging from 0.86 for one week and 0.88 for one year but numbers in the mid-60’s for 1 month, 3 months, and 6 months. What does this mean? It means the CAD will tend to track the euro, not the dollar. If the euro rises against the dollar, the CAD will rise against the dollar, too. What happened to interest rate differentials and commodity prices? We probably need to assume that they were affecting the euro as much as the CAD, or nearly so. Bottom line, finding causation in Forex correlation is sometimes easy, as in EUR/CHF against the dollar and AUD/NZD, but sometimes it becomes an analytical mess. 1. A correlation of 0.70 is good enough to assume a strong relationship. 2. Correlation coefficients are relatively stable across short and long time periods. 4. How many data points are required to calculate a statistically valid correlation coefficient in Forex?